On Wednesday when Mercury meets the Sun again, there’s a chance we may feel the need to express our thoughts fully, but retrograde motion of Mercury may cause us to speak before we think. A fortunate grand trine among the TaurusMoon, Jupiter and Pluto also in earth signs generates a compulsive emotional need to grow beyond ones’ boundaries. But with the Sun out of step with Neptune don’t allow frustration to take a toll. Mercury making a minor yet unstable connection to Mars causes minds to be restless into evening hours. Aloha kākahiaka Nā Kanaka. Hau’ōli aloha Pō’akolu. Ī lele ā ‘alohi a me aloha ke lā me aloha ʻole kōu puʻuwai. Ō kā maluhia no me oe. Good morning, People. Happy aloha Wednesday. Rise and shine and greet the day with aloha in your heart. Peace be with you. A moment’s thought shows that such a state can only be symbolized; to describe it, is impossible. Nor can it be symbolized except in negatives; for, since it is the state of Absoluteness per se, it can possess none of those specific attributes which serve us to describe objects in positive terms. Hence that state can only be suggested by the negatives of all those most abstract attributes which men feel rather than conceive, as the remotest limits attainable by their power of conception. Aloha kākahiaka Nā Kanaka. Hau’ōli aloha Pō’alua. Ī lele ā ‘alohi a me aloha ke lā me aloha ʻole kōu puʻuwai. Ō kā maluhia no me oe. Good morning, People. Happy aloha Tuesday. Rise and shine and greet the day with aloha in your heart. Peace be with you. Last night’s Full/Blood Moon Total Eclipse … if you missed it, catch the next event in 2033! Aloha kākahiaka Nā Kanaka a me Hau’ōli aloha Pō’akahi. Aloha ke lā me aloha ʻole kōu puʻuwai. Ō kā maluhia no me oe. Good morning, People, and a Happy aloha Monday to you all. Greet the day with aloha in your heart. Peace be with you. Here’s a little reminder that it’s OK to feel fear … just don’t let that fear stop you. Your dreams are too important! Being “courageous” isn’t about never being afraid. It’s about being bold enough to face what scares you and keep going. While it’s easy to stick with what feels familiar and comfortable, we only grow when we stretch. The more we cultivate the habit of pushing through our fears, the stronger and more fearless we become. Remember, it’s not about “never being afraid.” It’s about not letting your fears hold you back. And this is key to achieving your dreams! The modern archæologist, though speculating ad infinitum upon the dolmens and their builders, knows, in fact, nothing of them or their origin. Yet, these weird, and often colossal monuments of unhewn stones — which consist generally of four or seven gigantic blocks placed together — are strewn over Asia, Europe, America, and Africa, in groups or rows. Stones of enormous size are found placed horizontally and variously upon two, three, four, and as in Poitou, upon six and seven blocks. People name them “devil’s altars,” druidic stones, and giant tombs. The stones of Carnac in the Morbihan, Brittany — nearly a mile in length and numbering 11,000 ranged in eleven rows — are twin sisters of those at Stonehenge. The Conical menhir of Loch-Maria-ker in Morbihan, measures twenty yards in length and nearly two yards across. The Menhir of Champ Dolent (near St. Malo) rises thirty feet above the ground, and is fifteen feet in depth below. Such dolmens and prehistoric monuments are met with in almost every latitude. They are found in the Mediterranean basin; in Denmark (among the local tumuli from twenty-seven to thirty-five feet in height); in Shetland, and in Sweden, where they are called ganggriften (or tombs with corridors); in Germany, where they are known as the giant tombs (Hunengraben); in Spain (see the dolmen of Antiguera near Malaga), and Africa; in Palestine and Algeria; in Sardinia (see the Nuraghi and Sepolture dei giganti, or tombs of giants); in Malabar, in India, where they are called the tombs of the Daityas (giants) and of the Râkshasas, the men-demons of Lanka; in Russia and Siberia, where they are known as the Koorgan;in Peru and Bolivia, where they are termed the chulpas orburial places, etc., etc., etc. That no gigantic skeletons have been hitherto found in the “tombs” is yet no reason to say there never were the remains of giants in them.Cremation was universal till a comparatively recent period — some 80, or 100,000 years ago. The real giants, moreover, were nearly all drowned with Atlantis. Nevertheless, the classics, as shown elsewhere, often speak of giant skeletons still excavated in their day. Besides this, human fossils may be counted on the fingers, as yet. No skeleton ever yet found is older than between 50, or 60,000 years, 3 and man’s size was reduced from 15 to 10 or 12 feet, ever since the third sub-race of the Aryan stock, which sub-race — born and developed in Europe and Asia Minor under new climates and conditions — had become European. Since then, as said, it has steadily been decreasing. It is truer therefore to say, that the tombs alone are archaic, and not necessarily the bodies of men occasionally found in them; and that those tombs, since they are gigantic, must have contained giants, 4 or rather the ashes of generations of giants. If we turn to the New World, we have traditions of a race of giants at Tarija on the eastern slopes of the Andes and in Ecuador, who combated gods and men. These old beliefs, which term certain localities “Los campos de los gigantes“ — “the fields of giants,” are always concomitant with the existence of pliocene mammalia and the occurrence of pliocene raised beaches. “All the giants are not under Mount Ossa,” and it would be poor anthropology indeed that would restrict the traditions of giants to Greek and Bible mythologies. Slavonian countries, Russia especially, teem with legends about the bogaterey (mighty giants) of old; and their folklore, most of which has served for the foundation of national histories, their oldest songs, and their most archaic traditions, speak of the giants of old. Thus we may safely reject the modern theory that would make of the Titans mere symbols standing for cosmic forces. They were real living men, whether twenty or only twelve feet high. Even the Homeric heroes, who, of course, belonged to a far more recent period in the history of the races, appear to have wielded weapons of a size and weight beyond the strength of the strongest men of modern times. If the fossil footprints from Carson, Indiana, U.S.A., are human, they indicate gigantic men. Of their genuineness there can remain no doubt. It is to be deplored that the modem and scientific evidence for gigantic men should rest on footprints alone. Over and over again, the skeletons of hypothetical giants have been identified with those of elephants and mastodons. But all such blunders before the days of geology, and even the traveller’s tales of Sir John Mandeville, who says that he saw giants 56 feet high, in India, only show that belief in the existence of giants has never, at any time, died out of the thoughts of men. 1 We take the following description from a scientific work. “The first of these animals (the alligator) designed with considerable skill, is no less than 250 ft. long. . . . . The interior is formed of a heap of stones, over which the form has been moulded in fine stiff clay. The great serpent is represented with open mouth, in the act of swallowing an egg of which the diameter is 100 ft. in the thickest part; the body of the animal is wound in graceful curves and the tail is rolled into a spiral. The entire length of the animal is 1,100 ft. This work is unique . . . . and there is nothing on the old continent which offers any analogy to it.” Except its symbolism, however, of the Serpent — the cycle of Time — swallowing Kosmos, the egg. 2 It might be better, perhaps, for FACT had we more Specialists in Science and fewer “authorities” on universal questions. One never heard that Humboldt gave authoritative and final decisions in the matter of polypi, or the nature of an excrescence. 3 57,000 years is the date assigned by Dr. Dowler to the remains of the human skeleton, found buried beneath four ancient forests at New Orleans on the banks of the Mississippi river. 4 Murray says of the Mediterranean barbarians that they marvelled at the prowess of theAtlanteans. “Their physical strength was extraordinary (witness indeed their cyclopean buildings), the earth shaking sometimes under their tread. Whatever they did, was done speedily. . . . . . They were wise and communicated their wisdom to men” (Mythology, p. 4). Aloha kākahiaka Nā Kanaka a me Hau’ōli aloha Lā’pule. Ō kā maluhia no me oe. Good morning, People, and a Happy aloha Sunday to you all. Peace be with you. Those of you with placements near 0 Gemini would have experienced the energy of a Grand Mutable Cross, whereas, those with placements at 0 Leo or 0 Taurus would have experienced the energy of an absolutely Powerful Yod (Finger of Fate). Aloha kākahiaka kākou a me hau’ōli lā Pō’aono. Keia lā ke lā hiki ōla. Ō kā maluhia no me oe. Good morning and a happy Saturday to you all. Today is the dawning of a new day. Peace be with you. Click on the the link below to access a special FREE gift from Panache. We are still in the play called “now or never” and the final act is about to start. and yes, this is in fact the beginning of the final act. But since this play is improvisational, where you end it is entirely up to you and your level of trust and faith. Either you will be launched to a new experience of life and opportunity or you will question everything with skepticism and caution. Either way is good. The play is not over yet. Because this time may be fraught with a bit of chaos and craziness, it is very important that you do what you can to keep your grounding. So spending time in nature and with the more sane members of your community is a good idea. Beware of putting your faith and trust in the wrong things or in something that does not really resonate with you. Listen to yourself instead of to others who may be a bit delusional and have their own agenda. Stay neutral and refrain from judging that which is not yet complete. Walk with me with my meditation, “Beyond Awakening”, and let’s prepare for tomorrow’s powerful Full-Blood-Moon-Eclipse. Having a meat-free, vegetarian diet can help save hundreds of animals per year. Happy ‪#‎HugAVegetarianDay‬! Aloha kākahiaka kākou a me Hau’ōli aloha Pō’alima. E piha keia la mea ke aloha a me ka pono. Ua maika’ i no Pule kikipani me ‘ohana a me na hoaloha e. Ō kā maluhia no me oe. Good morning and a Happy aloha Friday to you all. May your day be filled with love and goodness. Have a good weekend with family and with friends. Peace be with you. Aloha āwakea kakou a me Hau’ōli aloha Pō’aha. I lā ho’okamaha’o nōu ōukou. Ō kā maluhia no me oe. Midday greetings and a Happy aloha Thursday. Everyone have a wonderful day. Peace be with you. Cultivate optimism. Optimism is essential for a healthy, functioning brain. Such an auspicious week, eh, folks? People all over our world are focused in prayer to bring themselves closer to their Higher Selves … and in so doing, bringing us all together in Peace … and what could be more Divinely Perfect than everyone acting in conjunction with the Equinox. The Jews observing their Day of Atonement in Silence … the Muslims trekking to Mecca … the Wiccans celebrating the end of the autumn harvest (Mabon) … and everyone observing the energetic changes that come with the Autumnal Equinox. 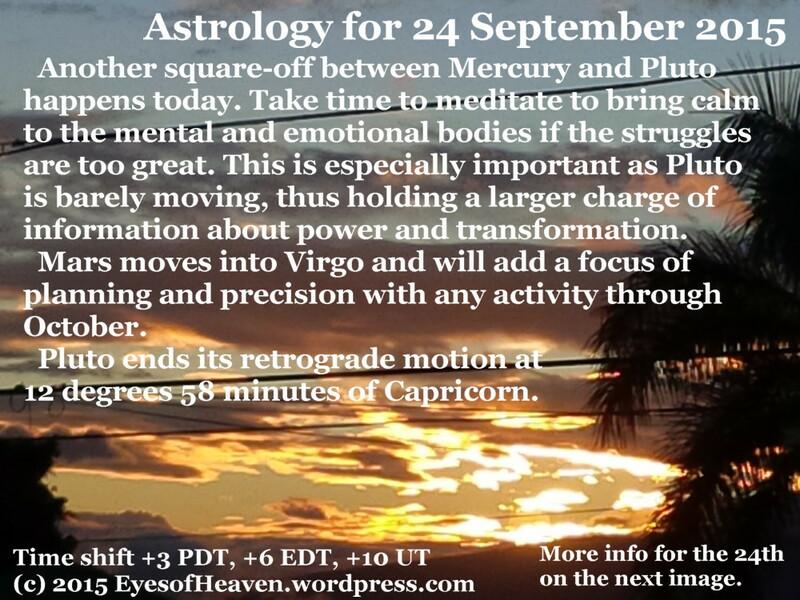 And on top of it all … Mercury Retrograde with the 4th and final Blood/Full Moon for 2015 and an Eclipse this weekend. It is, magnificently, the Ultimate (Re-)Balancing Act. Here’s to our World … may the next 6 months bring about the changes we intend for our Highest Good. A-LO-HA ‘AINA!! The Hajj is a religious pilgrimage to Mecca that a Muslim must make at least once in their lifetime. Read the about the experiences of Birmingham Muslims who have taken this trip of a lifetime. The Hajj is a very important part of the Islamic faith. Every year around 2 million Muslims converge on Mecca in Saudi Arabia. Dressed in white sheets the Pilgrims perform acts of worship and reaffirm their faith. Aloha kakahiaka kakou a me Hau’ōli aloha Pō’akolu. I la ho’okamaha’o nou oukou. Ō kā maluhia no me oe. Good morning and a Happy aloha Wednesday. Everyone have a wonderful day. Peace be with you. Happy Autumnal Equinox and a Merry Mabon To You All! OK, here comes the day we have been building up to since Solstice back in June. Day and night are of near equal length and the seasons officially shift. We welcome in Spring in the southern hemisphere and Autumn/Fall in the northern. Equinox brings us into balance. Have you noticed you have an intense need to relax and enjoy yourself as well as get on with your work each day? – Equinox opens the door on this week’s huge cosmic events. Notably the Super Full Moon and Total Lunar Eclipse. – It’s also the FINAL 22 MASTER DAY for 2015. We are being asked to be authentically enthusiastic about our life! – On Equinox we go still and come to centre. Therefore, ensure you meditate over the next 24 hours and be out of doors. Want to know more and why 1997 is back for a re-do this week? READ ON for the FULL TIP-OFF…your daily global energy forecasts and life guidance, 7-days in advance.